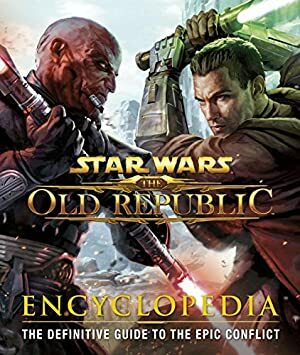 The Old Republic is one of the Bioware Star Wars computer RPGs. It is part of the Extended Universe, which is no longer canon since 2014. Its strength is to offer eight individual story tracks. Here is a version of the Sith Inquisitor “track”, covering the first 15-ish levels. As such there are S P O I L E R S for Korriban. 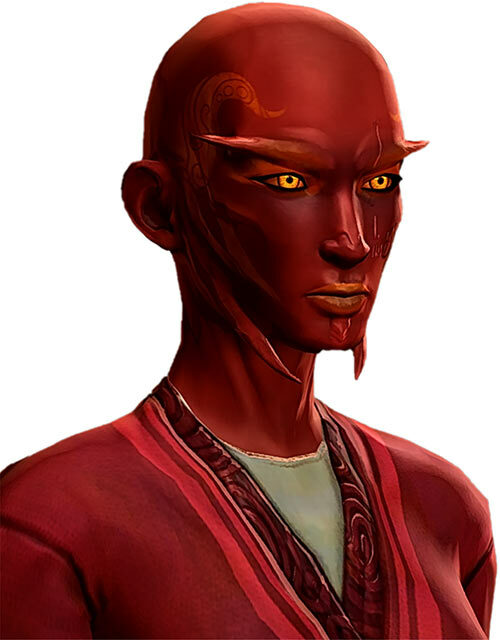 Since this is a RPG, Orfenn is but one *possible* version of the Sith Inquisitor. 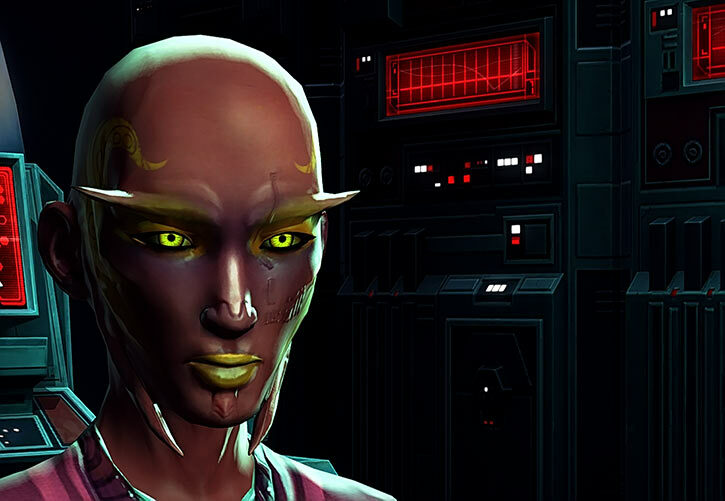 Orfenn Natrix the Sith Inquisitor (profile #1 – Early). 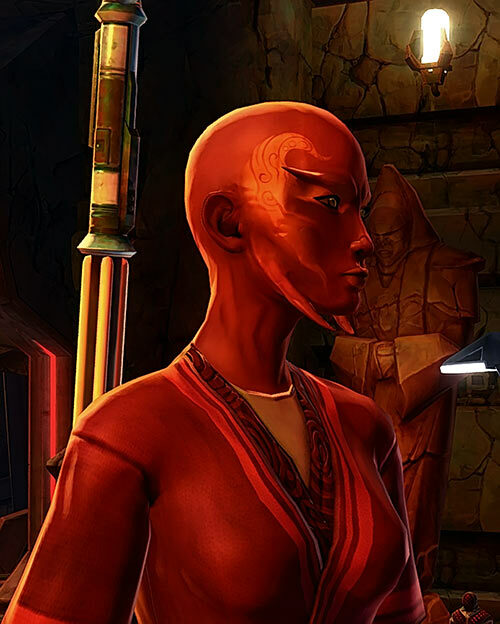 Orfenn Natrix the Sith Inquisitor (profile #2 – Visit scenic Korriban). One of the main character arcs for Orfenn is beating cancer. Some weeks after this profile was posted on our backstage work space, writeups.org contributor Civanfan was himself diagnosed with a Stage IV cancer. Therefore, this profile is dedicated to him and his ongoing fight against the disease. You can check his writeups.org publications simply by searching for his handle, like this. Other Aliases: “Slave” (at least that’s how everybody calls her when she’s one), Chronicle (pirate callsign), “Doctor Feelgood” (common nickname). Group Affiliation: Former member of the Drayen crime syndicate. Height: 5’4½” Weight: 88 lbs. Eyes: Bright yellow Hair: None (previously very dark red) Skin: Sith red. 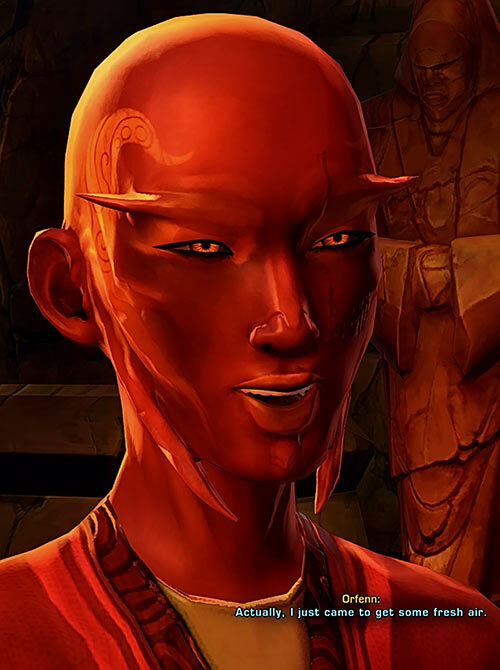 Other Distinguishing Features: Fullblooded Sith bone protrusions on her face, slave brand on her cheek, golden tattoos on her temples and the sides of her skull. Orfenn is both a Sith and a Sith, which may lead to confusion. Let’s review that. After a major war among the Jedi, a number of Dark Jedi masters were cast out of known space. Some of these exiles had heard rumours about a species of Near-Humans called the Sith. They eventually found their home world – Korriban. As alleged, the Sith peoples had exceptional ties with the Dark Side of the Force. With their superior technology and training, the Dark Jedi took over Korriban. They interbred with the Sith species as part of a heinous program of eugenics, and learned their secrets. They also conquered the small interplanetary empire that the Sith had carved back during their long-since-passed peak. This takeover was a *huge* rejuvenation of the Dark Jedi, now calling themselves the Dark Lords of the Sith. Predictably, it also led to all sorts of weird racial considerations about how Human-like or Sith-like their descendants were. 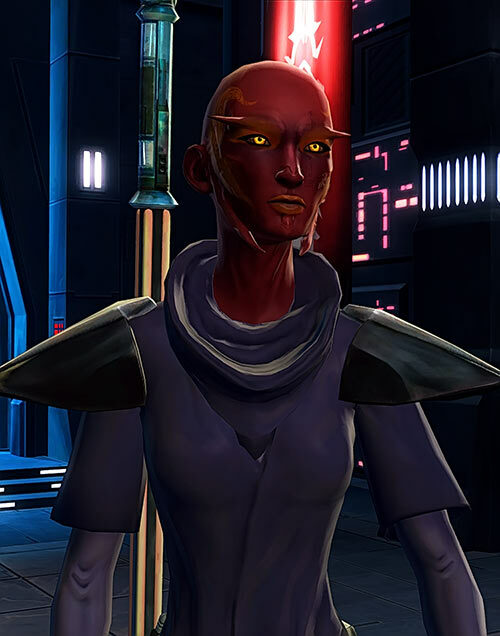 For instance, people like Orfenn are called “fullblooded” Sith. Genetically, this is nonsense. The term simply means that they are hybrids whose Sith-like physical traits are more readily visible. Depending upon the era, this may or may not bring prestige. Over time, the word “Sith” became chiefly used to designate those aligned with the Dark Lords of the Sith. This version of the Sith Empire, led by the powerful Dark Lord Naga Sadow , was defeated during the Great Hyperspace War. But it would eventually recreate itself, and become the New Sith Empire that clashed with the Old Republic. After every defeat a version of the Sith Empire would return. This lasted for thousands of year. One such return of the Sith Empire would eventually be organised by a man named Palpatine . To give a sense of scale, the Siths-from-Korriban had created their original Empire 28,000 years before Star Wars: Episode IV: A New Hope. The Dark Jedi took over Korriban about 7,000 years before Episode IV. 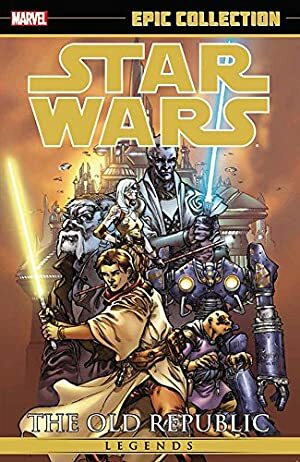 The events in the Knights of the Old Republic stories take place almost 4,000 years before Episode IV. 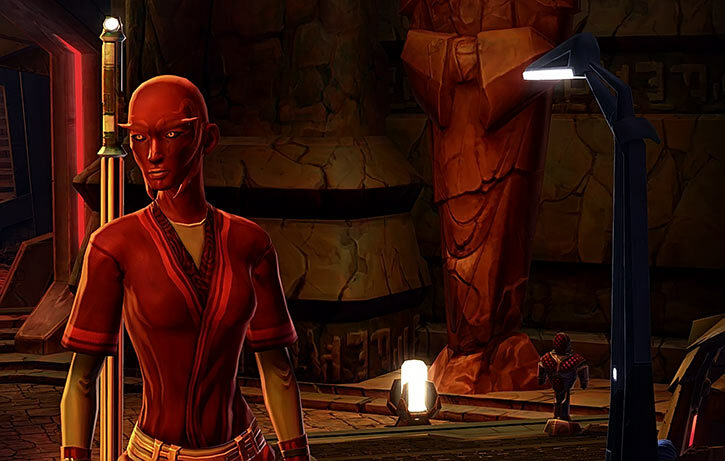 And the The Old Republic MMORPG, which we cover here, takes place about 3,600 years before Episode IV. 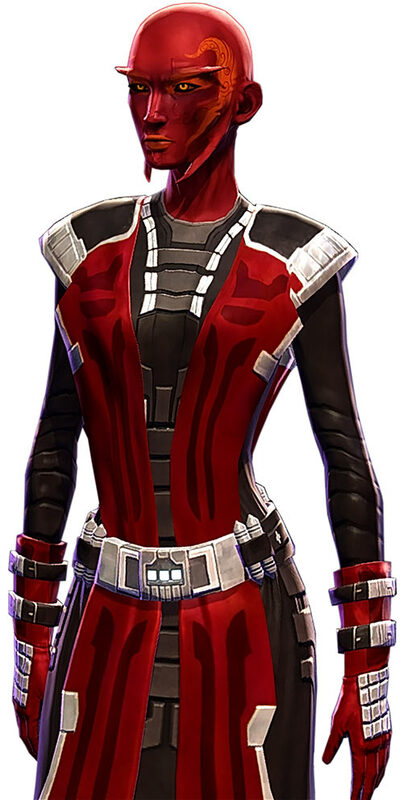 See our Republic Trooper profile for more about the Old Republic Era. The closing years of the Cold War era saw the rise of four apprentices with exceptional strength in the Force – Sabra Shulvu, Klustre Taschen, Meeyelle Mahr Ra Shrava Nolith Che… and Orfenn Natrix. Even as mere Jedi Padawan or Sith Acolytes, these four were markedly stronger than most made Jedi and Sith in the galaxy. Orfenn Natrix may be the most puzzling case. She is an expert at Force lightning. Meaning shooting torrents of electricity from her hands to burn and inflict great pain. This is what Emperor Palpatine does near the end of Return of the Jedi. 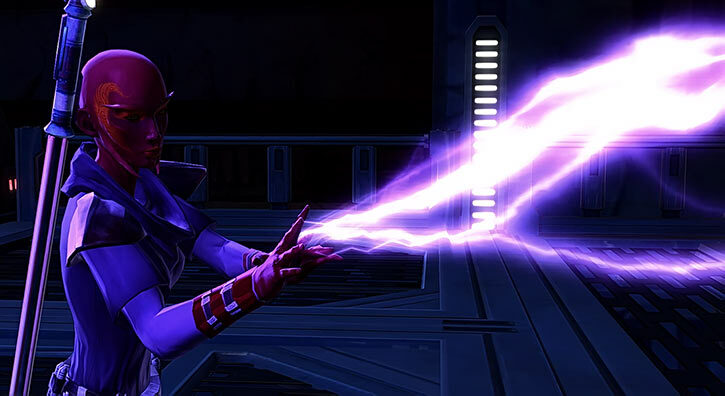 Force lightning is widely associated with the Dark Side of the Force since it is commonly used as a torture medium. Yet Natrix isn’t a darksider. It isn’t *that* puzzling, though. Force Lightning isn’t intrinsically a Dark Side power. It has been used in the past by such Jedi heroes as Meetra Surik or Bastila Shan. It is an easy and powerful way to torture people, yet it is possible to use it ethically and resist the temptation of the Dark Side. Being a Sith pureblood, Natrix finds it easier to channel this sort of energy. But this is due to genetic factors rather than after meditating about the Dark Side. In fact, she developed techniques to use low-intensity Force lightning for *curative* purposes. Wickedly sharp intelligence, with considerable cunning. Superb memory. Not quite at “photographic memory” levels, but way beyond the average. 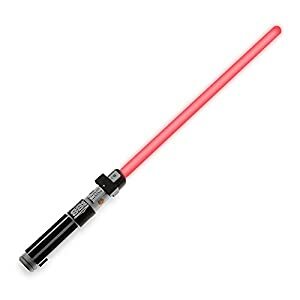 Robust but not spectacular combat skills with a lightsaber. She tends to wield hers defensively. Superb skills in pharmacology, biochemistry and other areas having to do with drugs. Solid skills in management, logistics and business. Some skills in security and intrusion. This is true of all SWTOR Player Characters, as discussed in other articles. This fist-sized, potato-like bio-construct was implanted mostly within Orfenn’s right breast. Its back is anchored between two ribs. From there tubing goes into her circulatory system. Through it, the bio-factory feeds her a complex mix of painkillers, antibiotics, cyclophosphamide, sci-fi cytotoxic compounds, fludarabine, doxorubicin and dozens of other pharmaceuticals. These keep her leukemia and cancers in check and nearly asymptomatic. The Natrix implant can be monitored and adjusted. This is done via a sort of transcutaneous remote pressed against her lower right breast, and connected to a computer. The access only unlocks with a “password” – namely a tiny, specific form of Force lightning spark. The Natrix module can be refilled every five years via an injection through the fat and into a specialised port. Everybody loves Phil Collins’ In The Air Tonight, one of the defining pop songs of the 1980s. Which is kinda funny since this tune is packed to the brim with anger, bitterness, betrayal and despair – plus a odd glint of hope. It’d be just right for the end of this writeups, thematically and lyrically. The song’s drum crash (5:28 in this concert) prolly is one of the most famous drum breaks of the last 50 years. The recording was memorably tweaked as the gated reverb effect had recently been accidentally discovered by Collins’ sound engineer, Hugh Padgham. Orfenn’s family have been slaves for centuries. They were sold off Korriban by a Sith warlord after the Dark Jedi takeover. They have since floated from one crimelord to another – often with heavy casualties. Orfenn was separated from her parents when she was about 3. The buyer, a Gran female crime lord named Fahrr, was specifically looking for small children. The job was to mine thin veins of ore in the Smuggler’s Run asteroid belt. A Gran is the same species as the three-eyed, pink-skinned Ree-Yees alien seen on Jabba’s barge in Return of the Jedi. Smuggler’s Run is located beyond the conventional end of the Corellian Run. It is a lawless area where partially excavated asteroids serve as havens for underworld freight runners. The Corellian Run is one of the very largest hyperspace routes in the galaxy. An hyperspace route is a sort of natural corridor where spaceships can fly faster-than-light for long distances without hitting something. The mining project was on Skip 5, one of the Smuggler’s Run partially habitable asteroids. The heat and static therein meant very costly, constant maintenance for mining droids. This in turn meant that throwing cheap slaves in crummy enviro-suits at the ore was less expensive and much less bothersome. Though the ore wasn’t *that* valuable, it played a key role in a money-laundering scheme. Thanks to a semi-sympathetic slavemaster, the conditions weren’t as bad as one could expect. Nevertheless, the radiation leaks were more than the cheap suits could handle. Leukemia wiped out the labourers over the next 12 years. The operation had been a success though. By that point the profitable ore was mined out. The remaining slaves were put out of their misery. Except for one. Though Orfenn was among the first to develop leukemia cells, her body somehow compensated for the marrow damage. She actually seemed to grow stronger, in a weird way. Her body often crackled with static, and she felt regular electrical shocks within. The other slaves superstitiously thought that she was a radioactive mutant. Most also thought that Sith had “evil powers”. Orfenn did manage to win back some friends by offering her “healing touch”. It was actually an instinctive use of her bioelectricity as transcutaneous nerve stimulation (TENS) therapy, providing pain relief. By the time the mining came to an end, even Orfenn was sick and wracked by constant pain. But unlike the rest she wasn’t terminal. Yet keeping just one slave out of the whole batch felt weird for the overseer. As the overseer raised his blaster , Orfenn lashed out with power she did not know she had. A torrent of Force lightning fried him. Still wearing her uniform and ID badge, Orfenn walked all the way to the small Skip 5 “spaceport”. These were simply prefabs serving as a clearing point for smuggling ships. She bullshitted something about a major accident that had left everyone dead. A full-featured pharma/narcotics production facility. Orfenn was thrown in with the slaves’ floater team. This team filled gaps throughout the workforce to compensate for sickness, accidents, workload spikes, etc.. They were unskilled and expendable. Poorly regarded as a Sith, fitting in badly and driven by pain and paranoia, Orfenn used this posting to reconnoiter the cushiest positions among the workforce. She then killed and intimidated her way to a permanent assignment. This was done by discreetly using her Force lightning as a death touch. The position she reached was with the ship’s narcotics production facility. During Orfenn’s dismal, squalid childhood drugs were the most valuable thing there was. Painkillers, sleep aids, radiation poisoning treatments, psychotropes… What little was smuggled to the miners was often viciously fought over. Therefore, she considered that access to the pharma facility was invaluable. Since she had no education whatsoever, even Orfenn’s threats and murders only got her a position as a cleaner of lab equipment. But that was a foothold. And since the facility generated so much profit, its slave workers were well-treated. Even the lowliest lab cleaner had it good compared to other slaves on the Buzzard. The job allowed for stealing some painkillers. That probably was how drugs had been smuggled to the miners. But the young Sith needed better access to treat the radiation damage. One of the cleaners was C2-TP, a centuries-old humanoid protocol droid. TeePee had lost its legs, and moved on a sort of skateboard. Orfenn threatened to slowly fry its memory module with her electrical touch if TeePee didn’t “teach [her] chemicals”. The poor droid complied, patiently starting by teaching her to read and count. So she could study more, Orfenn set up a system where other slaves did the cleaning work in her and TeePee’s stead. 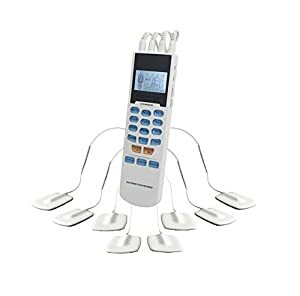 In return they received TENS-like pain relief via the Sith’s electrical touch. Despite her lack of prior education, Orfenn studied at a staggering pace. She could learn material after reviewing it but once. She could study nearly full-time, and TeePee was a sophisticated droid with a vast knowledge base and inexhaustible patience. Within four years of “remedial classes”, Orfenn had caught up with high-school-level education in multiple areas. 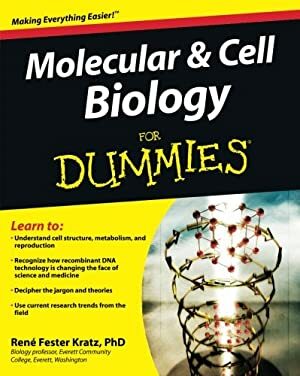 She was also taking college-level “classes” in molecular biology and pharmacology (!). She arranged further “accidents” and strong-armed her way into the technicians’ team. It had much better access to the drugs than the lowly cleaners. By that point, Orfenn’s goal no longer was to steal drugs. She had come to understand how Force lightning within her body had become a secondary immune system. It gave off constant internal shocks to destroy cancerous cells, damaged blasts and pathogens. Nevertheless, she would need constant medication to genuinely control her leukemia and malignancies. On one hand, this was doable using Star Wars medical technologies. But on the other, she didn’t have access to an hospital or oncologists. Orfenn focused her studies on a specific area. She learned to build compact, implantable bio-factories. These were capable of synthesising and releasing medical compounds within a patient’s organism. This type of implant was well-trod ground. But the tech was expensive for lack of production scale. It was only used by sick people who had to live far away from medical structures – and by some special forces soldier types. Still, it could be built with the resources within the Badass Buzzard. Furthermore, Orfenn could freely work while the lab was supposedly vacated between shifts for cleaning. She had an “understanding” with the cleaners. Orfenn grew a small artificial organ based on the Natrix-class biofactory design. She then had C2-TP’s core systems and memories transplanted into an unused medi-droid body. She traded that with the droid maintenance crew for a batch of home-cooked sexual stimulants. Once “her” droid was back online, she used a white room in the pharma facility as an operating theatre. The Natrix module was implanted in the back of Orfenn’s right breast. After recalibrations it started trickling its medication cocktail straight into the Sith’s veins. This profile is continued in part #2 ! Source of Character: Star Wars: The Old Republic MMORPG. Writeup completed on the 20th of January, 2018.